Materials from renewable resources are receiving increased attention, as leading industries and manufacturers attempt to replace declining petrochemical-based feedstocks with products derived from natural biomass, such as cereal straws. Cereal straws are expected to play an important role in the shift toward a sustainable economy, and a basic knowledge of the composition and structure of cereal straw is the key to using it wisely. Cereal Straw as a Resource for Sustainable Biomaterials and Biofuels: Chemistry, Extractives, Lignins, Hemicelluloses and Cellulose provides an introduction to straw chemistry. 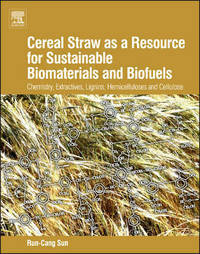 Topics discussed include the structure, ultrastructure, and chemical composition of straw; the structure and isolation of extractives from the straw; the three main components of straw: cellulose, hemicelluloses, and lignins; and chemical modifications of straw for industrial applications. This book will be helpful to scientists interested in the areas of natural resource management, environmental chemistry, plant chemistry, material science, polysaccharide chemistry, and lignin chemistry. It will also be of interest to academic and industrial scientists/researchers interested in novel applications of agricultural residues for industrial and/or recycling technologies.